Bon Appetit has a couple of winning recipes in the June 2013 issue. The Spiced Salmon Kebabs are fresh, healthy, easy and perfect for summer. 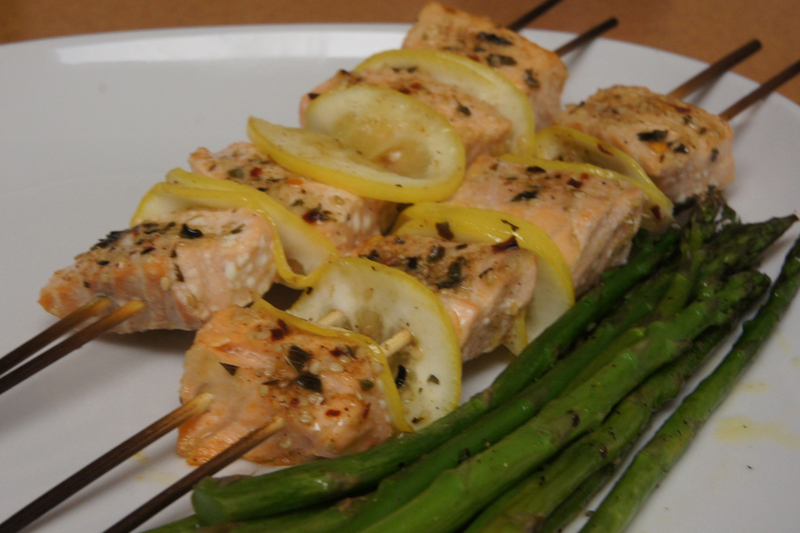 Salmon pieces are threaded on bamboo skewers, alternating with thin slices of lemon, which adds bright acidity and complements the spice mixture of cumin, sesame seeds, oregano, and red chile flakes. Instead of grilling, I put the kebabs in the broiler for 2-3 minutes, then flipped them over for another 2-3 minutes. This is also perfect timing to broil some pencil-thin asparagus on the side. Another winner from June 2013 Bon Appetit magazine. This is a sweet take on bruschetta. Cherries and plums or nectarines are macerated with a little sugar, olive oil, vanilla, and a pinch of salt. Whole milk (not skim) ricotta is sweetened with a little bit of sugar. 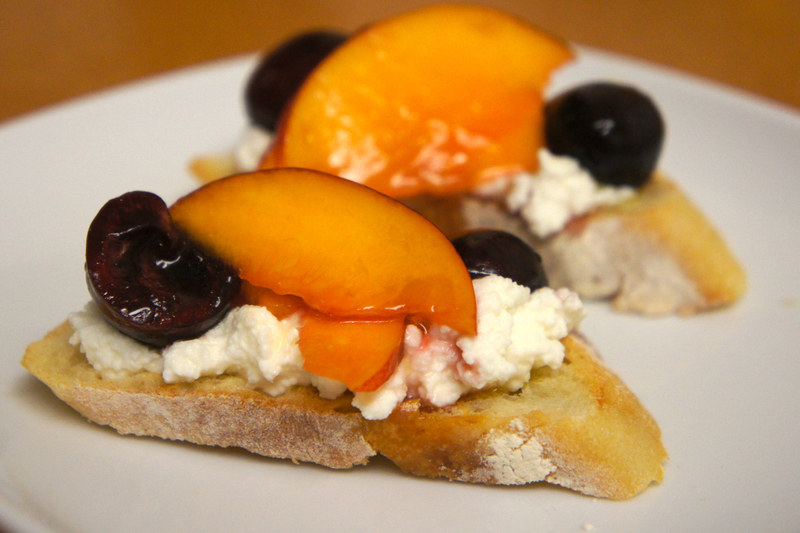 The ricotta and macerated fruit go on top of a toasted baguette slice for a perfect summer dessert bite. 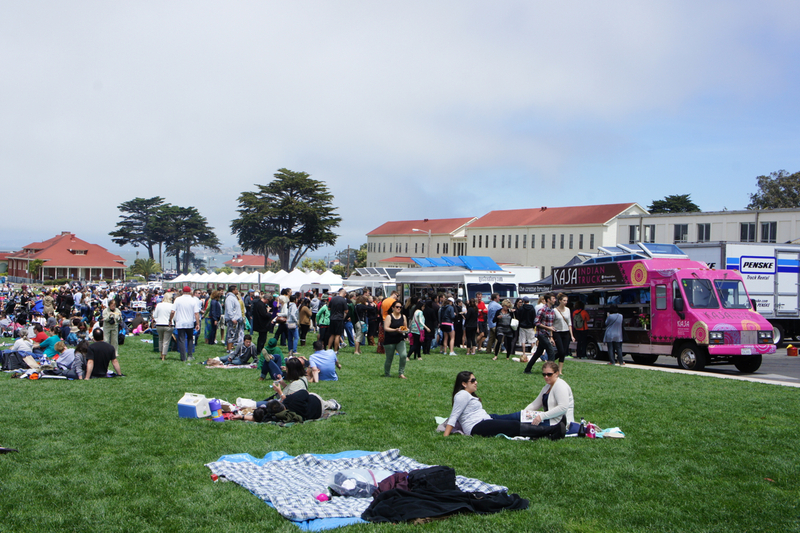 The Presidio lawn near the Golden Gate Bridge is a great setting for an Off the Grid food truck event every Sunday from 11-4 from April until late October. There were about 18 food truck vendors and similar number of farmer’s market stands. There is a beautiful lawn in the Presidio that makes for a very laid-back, fun, family- and pet-friendly atmosphere. Sports Basement had hoops, balls, and frisbees for loan for free with deposit of a driver’s license. Definitely a different, more open feeling than Friday nights at Fort Mason or StrEAT food park. With so much competition in the food truck realm, the vendors are stepping up their game in terms of food offerings. I am a big fan of The Whole Beast, ever since trying their Lamb Poutine at the Eat Real Fest in Oakland in 2012. They offered some succulent, smoky ribs on top of Japanese noodles that were quite delicious. The lemon and ricotta doughnuts tossed with fresh lemon zest and powdered sugar at Streatery were also outstanding and a relative bargain at $3 for 5 or 6. Other creative offerings from Streatery included their pea crepe salad. Tataki had a special of 4 items for $15 – the hand rolls and croquettes were good. Definitely worth checking out for a nice Sunday picnic. Link to Picnic at the Presidio here. Japan Airlines food is so much better than the food served on US carriers. I really enjoyed their signature drink, Sky Time, a smooth citrus cocktail that is so delicious I ordered it every single time there was beverage service. Instead of flavor-less pretzels, they serve savory Japanese rice crackers. Their meal service has Japanese and Western options. The Japanese options are typically beautifully presented, multi-component, well-balanced meals. There were great bento boxes with individual bites of food, in both economy and business class. In between meal service, they put out individually packaged Japanese sweet and savory snacks (I took a selection). In business class, one can also order udon soup or lamb curry anytime. The service is excellent, beyond friendly and courteous. Haneda airport in Tokyo is also a great hub. There is a large Edo-style marketplace that has great udon and ramen shops. Haneda is also much closer to Tokyo (~30 minutes by train or monorail) than Narita, and I was able to visit the Tsukiji Fish Market and Ginza during layovers in Tokyo. Definitely recommend JAL for trans-pacific routes. A fun site for pics of airline meals is at AirlineMeals.net. Shin Yeh has multiple locations in Taipei that serve delicious Taiwanese food in an upscale setting. Picture menus available. There are individual tables and private rooms with incredibly professional service. I had a great dinner there to cap off a week of eating through Taipei. The Taiwan burger was really delicious – steamed bun filled with pork belly, preserved vegetables, and pork sung. I liked it better than the pork belly bun at Momofuku! Also outstanding was the steamed glutinous rice with crab. This particular branch was located in the new Shin Kong Mitsukoshi department store on the 8th floor, overlooking the modern, Manhattan-like Xinyi District near Taipei 101, one of the tallest buildings in the world.